This spread from the graphic novel “Goodbye, Chunky Rice” by Craig Thompson shows many of the powerful and complex design options offered by the concept of framing: The individual parts of the comic strip are each frames, and some of them are delineated by a thin black border. However, a frame can also be implied in more subtle ways. It is especially interesting how these pages draw attention to the idea of frames within frames: Some of the frames fill a whole page, reminding me that a page and its edges are a sort of invisible frame that I might take for granted. On the top left I see the setting for all the action depicted very clearly: A small boat is floating in a vast ocean and the sun is setting over the water. The smaller frames beneath this image are literally placed inside the larger frame, so I infer that the turtle looking in his bag and at his stopwatch is taking place on the deck of the ship. 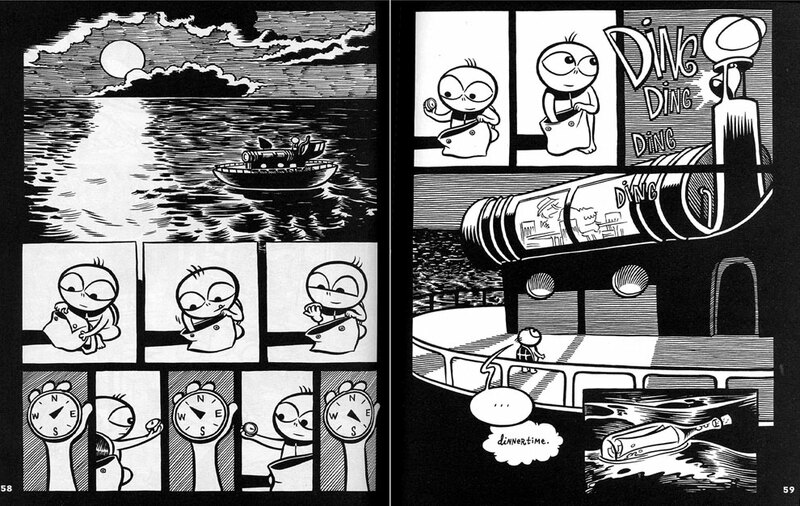 An even cleverer shift occurs on the right page, where the third small frame, showing the words “DING DING DING”, is also part of the larger frame below, which shows the deck of the ship. Finally, another small frame on the lower right introduces a new element, a bottle, which is presumably floating in the ocean. The frames with frames and the shifts in scale of the frame sizes makes this comic more visually interesting and adds to the potential complexity of the meaning it offers.